In JFK’s time it became a national craze, a challenge accepted by people of all walks of life despite claims in those days of the growing softness of the American people. Claims not too dissimilar to those made these days. We believe those doubting the generations of today are looking in the wrong places. Many of us are not only up to such a challenge, we’re starving for some way to push ourselves to those new limits, and beyond. 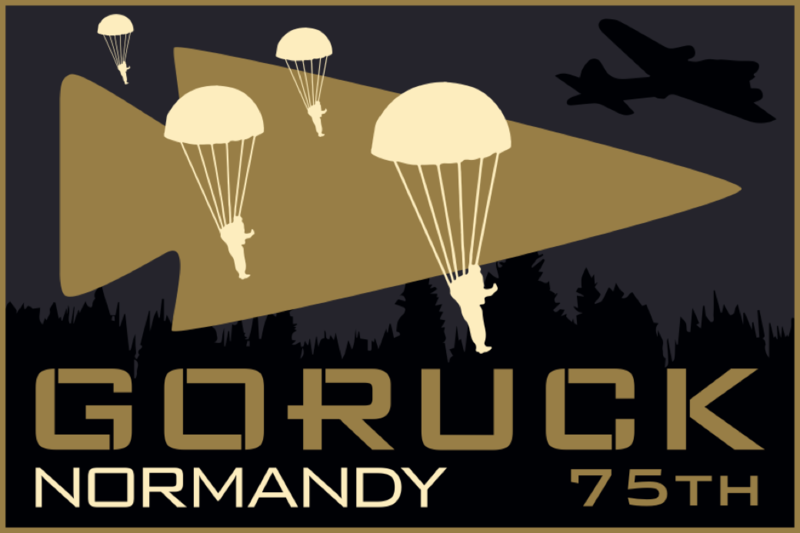 What better way to prove that to yourself than by rucking 75 kilometers in honor of the 75th anniversary of D-Day. Rucking is the foundation of Special Forces training and the “Star Course” is the culminating rucking exercise of Special Forces Selection. You show up with your ruck and you get a list of waypoints. You plot your route, then you start rucking: point to point, kilometer after kilometer. For a lot of miles, and in this special case, a lot of kilometers. Finishers earn the once-in-a-lifetime GORUCK 75th Anniversary Normandy Star Course 75km patch, which will never be for sale. You and your team of 2-5 (including you) show up at the Start Point. A GORUCK Cadre will issue you a map and a list of waypoints. The route you and your team choose will be your own, so choose wisely. The minimum distance possible will be just over 75 kilometers. You can expect to see the best sites on these hallowed ground, where the Greatest Generation gave so much 75 years ago. The course will be at least 75 kilometers. You and your team can hit the waypoints in whatever order you want (good strategy helps). Weight Standard: If you are under 150 lbs (or 68 kg), carry a 10 lb (or 4.5 kg) weight and if you are over 150 lbs, carry 20 lbs (or 9 kg). Each participant will have a 10 or 20 lb Ruck Plate (or equivalent in non-consumable weight) in their rucksack at the start point. GORUCK Cadre will verify weight at the end of the event and spot check as needed. Keep your 10 or 20 lb Ruck Plate (or equivalent) per participant with you at all times. You may cross load with your buddy/team members as desired. Call 112 with any real world emergency. We will provide a phone number on your waypoint sheet for GORUCK support questions. Cut-off time: 20 hours to earn the patch. If you come in under 20 hours, you and your teammates earn the patch. If you don’t, there’s always another Star Course event calling. It’s about the journey, and finishing is a noble and worthy goal. "This operation is not being planned with any alternatives. This operation is planned as a victory, and that's the way it's going to be. We're going down there, and we're throwing everything we have in to it, and we're going to make it a success." 75 Years Later: the liberation of Europe begins on June 6 1944 as OPERATION OVERLORD. In 2019, all eyes will be on the D-Day beaches and the sites of the Battle of Normandy for the 75th anniversary of this awe-inspiring day in history. Commemorate the D-Day Landings by rucking and re-enacting OSS movements in honor of America’s Greatest Generation who liberated France and Europe. This special event gives a first-hand experience of the exploits of Allied Forces during the D-Day Landings. Fact: these are sacred grounds everyone should visit at least once in their lifetime. Band of Brothers is our favorite, but books and movies will never do it justice. We believe those doubting the generations of today are looking in the wrong places. Many of us are not only up to such a 50 Mile Challenge, but we’re starving for some way to push ourselves to those new limits, and beyond. Finishers earn the GORUCK 50-Miler patch, which will never be for sale. You and your team of 2-5 (including you) show up at the Start Point. A GORUCK Cadre will issue you a map and a list of waypoints. The route you and your team choose will be your own, so choose wisely. The minimum distance possible will be just over 50 Miles. You can expect to see the best sites in your city, and you can expect at least one long movement taking you to the outskirts, and possibly beyond. The course will be at least 50 miles. You and your team can hit the waypoints in whatever order you want (good strategy helps). Teams are between 2-5 participants. If and only if the rest of your team withdraws or drops for whatever reason, you can continue solo. If you hit all the points under the allotted time hack, you’ll earn the patch. You are not eligible for any prize money. If this happens, we recommend you link up with another team if possible (you’ll still have to post your own pics) to make it more fun as a shared experience. To be clear, though: you have to hit all the waypoints under the time hack to earn the patch. If you come in under 20 hours, you and your teammates earn the patch. If you don’t, there’s always next year. It’s about the journey, and finishing is a noble and worthy goal. But for those kindred spirits who want a little healthy competition, we’re offering some GORUCK cash prizes for the winners.